In virtually all industrialised countries, the production sector suffers from an acute shortage of skilled labour. Due to the expected demographic development, it is foreseeable that this shortage is going to get even worse in the coming years, especially in the European countries. Even now, numerous projects get put on the back burner or entirely deleted from the agenda in many places, because they simply cannot be realised due to lack of technical capacities, or because long-term reliable operation of technical equipment cannot be guaranteed. When planning the realisation of injection moulding projects today, aspects of technical feasibility are not the only questions to be considered, but increasingly also the capacities for reliable production in view of an, often insufficient, pool of expert staff. The principle known in the Anglo-American region by the acronym of KISS (= “Keep it simple, Stupid”) is also taking on greater significance in Europe. For the injection moulding industry, the KISS principle indicates an increasing necessity to invest in optimised production cells which are easy to run. This includes intuitively operated, self-learning control systems for injection moulding machines – such as the B8 machine control system from WITTMANN BATTENFELD with its HiQ software packages. Just as vitally important is the selection of a robot to take care of fast moulded parts removal and to support high-speed downstream finishing. Robots equipped with the R8 and R9 control systems from WITTMANN are ideally suited for such purposes. Linear axes are used for the basic traverse movements, which must be carried out within the generally very confined mould space. For additional functions – which are normally required outside the mould space – they are combined with compact rotation axes. The linear axes permit quick and easy extension and retraction of the gripper. In contrast to working with articulated robots, the operator here is not required to change to and fro between different systems of coordinates or concern himself with all possible types of collisions that may be caused by multi-axis movements. Although the WITTMANN R9 robot control system also allows manual selection of any desired movement coordinates in space, the movements of the robots’ main axes are nevertheless invariably orientated within the Cartesian coordinate system. In contrast to articulated robots, the risk of collision can be substantially reduced, as well as the training expense for the operating staff, for whom the movements of the robot invariably remain clear and understandable at all times. WITTMANN robot control systems provide two different user levels as standard, which can be selected depending on how familiar the operator is with the system. QuickEdit allows changing of a few commands and programming with templates. The TextEditor grants complete freedom in programming. With its help, any desired robot sequence can easily be realised menu-driven. Each individual function is carried out directly on the robot and then taken over into the program by pressing a key. Free allocation of names for interfaces of auxiliaries, cylinders, gripper and vacuum circuits facilitate readability and permit clear structuring of the program. The idea behind QuickEdit is to enable operators without previous experience in equipment programming to create a program. With QuickEdit, the robot is programmed in very easy steps. 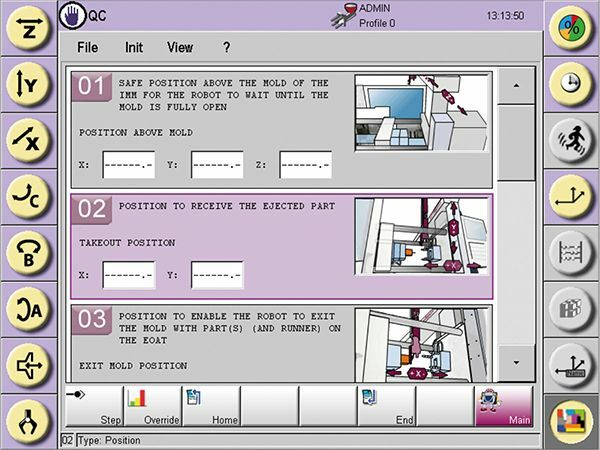 Using pictures and animations, the control system proposes the sequence step by step and explains to the operator the correct input. This method of programming is primarily used for simpler applications, such as ‘pick & place’ functions, or parts removal with sprue picking and subsequent depositing. Such simple programs can be created with the help of the new QuickNew function. QuickNew is the animated program editor which supports users in the creation of QuickEdit programs.